Agents can access queued emails from the same customer, review and respond to them at once. When a customer sends multiple emails within a short time interval regarding a case, all emails get queued. When an agent opens the first email to respond, there is a link to view the queued emails from the same customer. The agent can click this link to view all the queued emails, and review and respond in a single email if they are related to the same case. This helps agents consolidate their response in a single email and increase their efficiency while improving the customer experience. Allows centralized access to queued emails from the same customer. Improves customer experience with a consolidated response to multiple related emails. Increases efficiency by preventing multiple agents to work on related emails from the same customer. AgentAgents use the Agent Console to view and manage customer interactions. Virtual Contact Center supports Regular agents and Supervisor agents. A receives and accepts the first email from this customer, and responds. Agent B receives and accepts the second email from this customer, and responds. Agent C receives and accepts the third email from this customer, and responds. Set your status to Working Offline. Open the email queue in the Control Panel and click Pull. In the Pending Emails, open the customer's email and start working on the case. 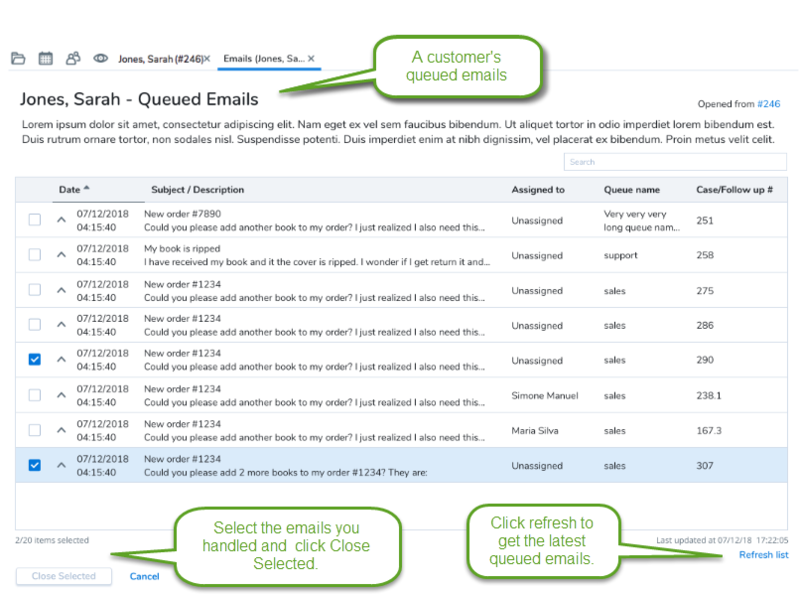 While crafting a response to the case, click the Customer Queued Emails to open the list of queued emails from that customer. The red dot indicates there are some related emails in the queue. 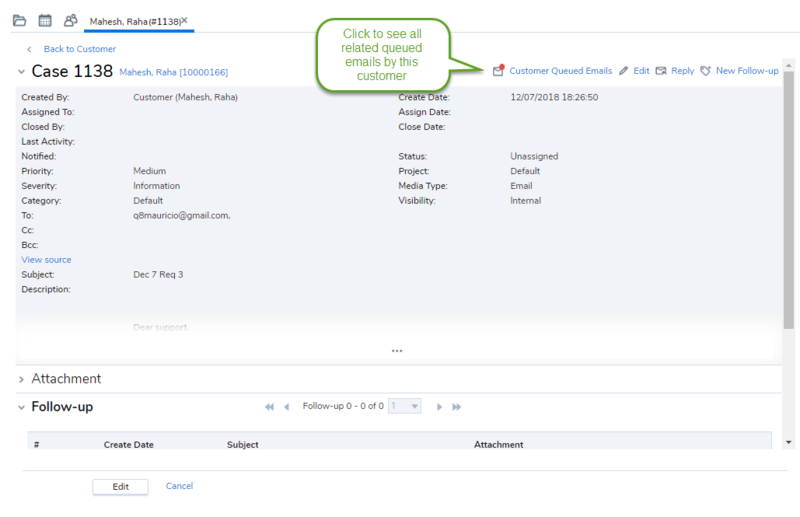 In the customer's Queued Emails, click any row to expand or collapse. You can preview the email contents. Craft your single email response while checking the related emails. Click Refresh list to update the queued emails. The queued emails list is not automatically updated. The manual refresh displays the exact date and time of the update. Note: You can select up to 20 queued emails at a time. Change the order of emails, or sort them by desired fields. You can search by any field except Subject/Description. Click Send once your email is complete. In queued emails, select the emails you have already handled and click Close Selected. It assigns the open cases to you, closes the cases, and removes them from the queue. For details, see our content on how to process email interactions.